Do you drink water straight from the tap? Or maybe you are like some people I know that skip the water and pop a beer bottle open. I have news for you if you are one of those people, you are not getting the proper water supply to your body. We need water… Our bodies require water. Humans can go for long periods of time without food but without water, they will die quickly. Today, I am going to provide a review of the Amway E Spring water filtration system. This is a completely unbiased review. I am not affiliated with Amway at all. So what makes me have the ability to provide a comprehensive review of the Amway E Spring water filter system? I am quite happy to answer that question. In my younger days, I trained for several months and became a certified maintenance service person and installer for a well known water purifying company. I will not share the name of that company, but I will say that I installed and serviced water softening units, iron removal units, reverse osmosis drinking water units, and much more. I still utilize water testing kits to see how the water is that I use. Believe me, I would never drink tap water here in Puerto Rico, and it is doubtful I would drink tap water from most other places. You see even with deep wells, the contaminates that have been sprayed on soil has seeped into the water, not to mention the septic systems that have been improperly installed or maintained. And, to purchase bottles of drinking water can add up to expensive amounts over the long run. Let’s just throw some figures in the air. Let’s say I drink 5 bottles of water per day and a case of bottled water is $4.00. So for 1 person, I would be spending over $250 per year for a resource that should be free. So $1,000 per year for 4 people. Doesn’t it make good sense to filter that water yourself? But is the Amway E Spring water filtration the best way? The E Spring water filtration system is actually a simple process that is used to clean water of the various bacteria and organisms that can damage our bodies. The system has a carbon block that the water runs through. The carbon captures a slew of items that are not good for our bodies. You see, many things have carbon in them and carbon “binds” to carbon. So as the organisms pass through, they stick to the carbon block and allow cleaner water to flow out. But that is not the only cleaning method used by the Amway E Spring water filter system. The water must also pass a UV light. That UV light kills those extra small organisms that can get past the carbon block. The system can sit on top of the counter or below it and is actually not too difficult to install. I must admit that at first I was skeptical of this system. I entered a location that had one, so I drank the water and it tasted good. I performed tests with the testing equipment I still had left over from the past and found that the water tested just as good as water that came from a reverse osmosis water purifier. By the way, filters for a reverse osmosis system are much more expensive than the E Spring system and you practically need a college degree to change them (slight exaggeration). NSF is an independent not for profit organization water certification agency. Amway passes the standards set by NSF which tells me it does work. 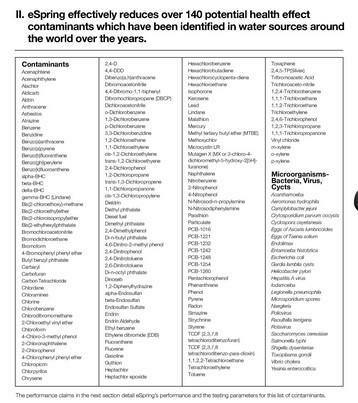 Below is a list of the many contaminates the Amway E Spring water filter system will remove. The initial cost is somewhat high. You can find the system on Amazon for around $800. And filters need to be changed annually at a cost of around $200. The system is good looking on the counter. Takes odors out and improves water taste. It doesn’t remove beneficial items such as calcium and magnesium. It will treat up to 1,320 gallons of water on one filter. The filter is easy to change and the system attaches to most water faucets. So would I recommend the Amway E Spring Water Filter? Yes I would. It is patented technology and I believe it is as good as many of the reverse osmosis systems which are much more expensive. It would be nice to see if Amway could develop a similar method of “back-flushing” the filters so they would last longer, but I may be dreaming. 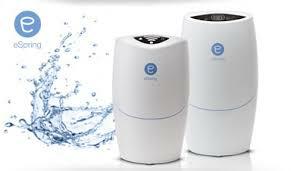 Overall, I give the Amway E Spring water filter system 4 of 5 stars which is quite good coming from a guy who knows clean water. I would love to hear your thoughts. Do you use an Amway E Spring system? Have you drank water from one? Please tell us your opinions below. 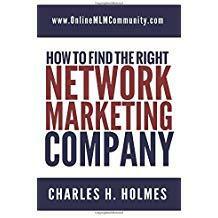 Please leave your comments below and will you please share this review on social media? Thank you and have a great day! Oh, and drink plenty of water daily; your body needs it! Next Next post: Does Face to Face Selling Still Work in a Digital World?